It's nearly been a year since I defriended him. And the sweet life I envisioned hasn't exactly gone as planned. Today, my brain feels like that up there. Shave ice. Not to be confused with shaved ice. Or Italian ice. Just sayin'. See I know I have that touch of color, creativity in there. 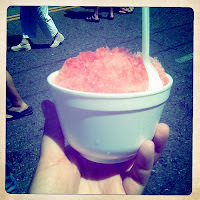 And since it's Hawaiian shave ice, you know there's a hint of the exotic. But my brain is mush, like someone took a razor to it. And it can melt at any moment. Yup, shave ice. This summer has taught me Amara is entering this tween stage a bit earlier than I had hoped. Gone are the days where she could play quietly in the corner. By herself. Toys no longer interest her. She requires my attention because she wants to have a conversation about clothes or boys or Darren Criss. Thursday I spent nearly eight hours in a windowless room about double the size of Amara's closet. And I wrote until my brain could take no more. My mind races a mile a minute these days. And it's not just work. I have had to reevaluate many relationships in my life. Have you talked to your Dad lately? Have you seen one of your closest friends? Better yet, has one of your best friends returned your call? Even when mushy, I like to think I still have perspective. A recent medication change brought on an allergic reaction. Nothing severe, but it sure is annoying. As in I-looked-diseased-when-I-wear-tank-tops-and-dresses annoying. And did I mention I'm still married? I'm not here to tell you a sob story. 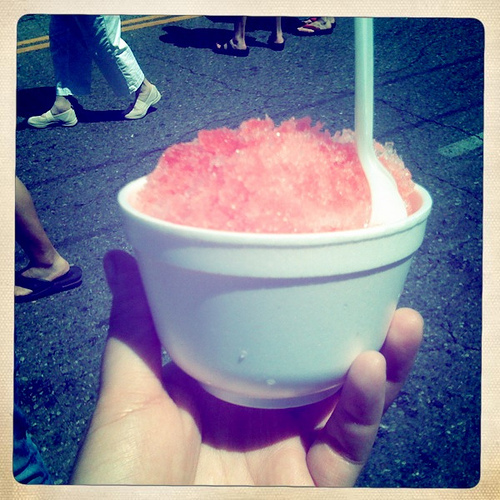 Because honestly the photo of shave ice makes me think of the beach. And that's where I want to go. Unleash all of that Lychee (I'm guessing) red energy that's being drizzled over the cone. If you need to find a rock under which to hide, make it a rock on the beach. Love your family and friends. Just learn who you can trust. It will help in the long run. Monina, this is the first post I'm seeing since randomly finding you on Twitter, and I clicked through a couple of older posts that you linked back to. Sounds like you've had a rough go of things, but that you are doing your best to cope with it all. Your daughter is beautiful - focus on her and somehow it'll all be okay. Glad to have reconnected, and looking forward to following your journey from here. Hugs. So sorry this has all been such a tough year. I'm glad to hear you are thinking of shave ice and beaches though. Those are positive thoughts and that's a good thing. One thing that's gotten me through my hard times has been just putting one foot in front of the other focusing on the little glimmer of hope that says it will get better. Focusing on the little things is important too. Sunshine, shave ice, and simple smiles can keep you moving forward. By the way, if you can believe it, I've never had shave ice and now I'm intrigued and must try it!